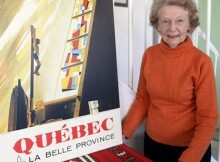 Marcelle Barbeau feels very small, faced with the danger that hangs over the church Notre-Dame-de-Fatima, located in Jonquière. Realizing that the hourglass is almost empty, that the destruction of the building is imminent, the one who shared the life of the artist Jean-Guy Barbeau for 54 years can only deplore this loss. Thus will disappear one of the architectural works that have brought Quebec in modernity, as well as the two stained glass windows made by her husband. Photo: Marcelle Barbeau pose fièrement à côté d'une affiche mettant en valeur l'église Notre-Dame-de-Fatima. Le vitrail a été réalisé par son mari, Jean-Guy Barbeau, au début des années 1960.